'Date Night' had to be funny, simple as that. I have never been a huge fan o 30 rock although I have enjoyed Tina Fey in her feature work as well as on SNL. On the other hand, I watch the Office religiously and have loved Steve Carell since "Bruce Almighty." The pairing of these two sitcom comfedians was an idea just waiting to happen and I am so pleased it finally has. The movie is a complete farce with funny improvisations and cameos all over the place. From the beginning we get a sense of what a fun couple these two are and the premise is set when two friends reveal they are getting divorced. 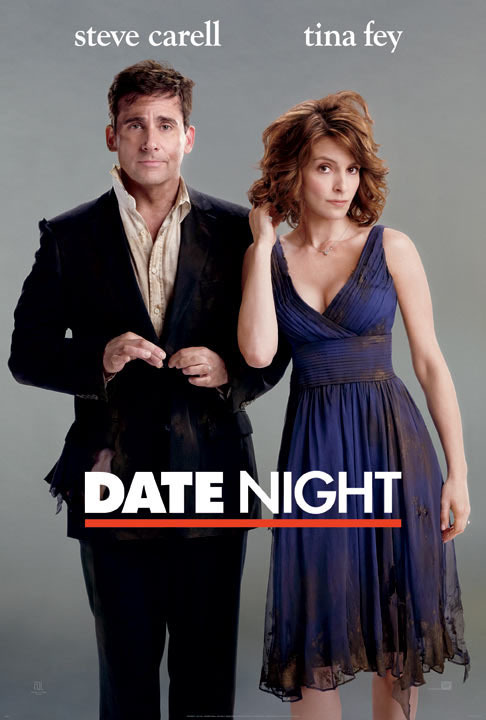 Carell seems such a good guy and here he shows his care for his marriage by taking his wife out on a date that isn't the same old date at the same old steak restaurant. From the second that Carell and Fey realize they are wrapped up in something bigger than themselves the movie takes off into high gear and doesn't slow down until the final frame. The situations they get caught up in never seem tired despite being pretty familiar ground and it really is the actors here who make this material so much better than it might have been in lesser hands. From Mark Wahlberg who is subtly hilarious as an old client of Fey's who never wears a shirt to James Franco and Mila Kunis as the couple whose reservations Carell and Fey stole. It just feels like a big collaboration of fun and excitement, one that I could easily watch over and over again. I'm not sure how I feel about this movie. There's something about Tina Fey outside of SNL's Weekend Update that bugs me and I can't figure it out. Also, those movies where everything goes spiraling out of control and nothing ever goes right give me anxiety attacks. What can I say? I'm a weirdo. I get what you're saying about Tina Fey, I have that kind of feeling towards her as well, but she's really funny here and Carell is awesome as always. If you have to wait for the DVD so you can pause it and let your anxiety settle before you play it again, I understand, but you gotta see it. Really funny.